We've all heard it before: Higher risks demand higher rewards. Most investors take this statement as gospel. But it was only until the 1950s that the idea became popular, when economist Harry Markowitz laid the foundation for Modern Portfolio Theory. The theory describes the proper relationship between risk and reward in portfolio construction. Today's chart shows that theory at work in the real world. To do this, we're taking another look at the corporate bond market - again comparing default rates per bond credit rating to their effective yields. 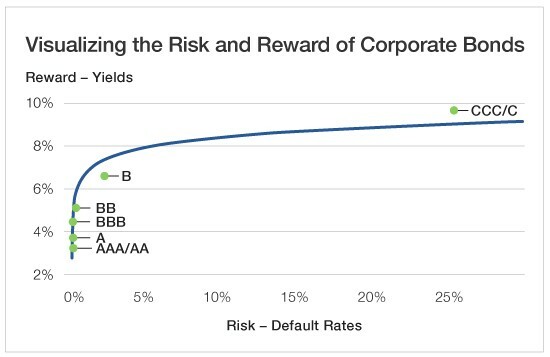 Last week, I broke down the corporate bond market to reveal how increasing levels of default risk correspond with increasing levels of reward in the form of yield. I also emphasized that the generalizations of comparing "investment-grade bonds" with "junk bonds" didn't show the middle ground of high-yielding bonds and relatively low-default bonds. Today's chart presents the same data in a different way. It also reveals just how nonlinear the relationship between risk and reward is, suggesting not all risk-taking is worthwhile. Look closely at the left side (or low-risk section) of the chart. You'll notice that slight increases in risk result in much larger increases in returns. This shows that taking modest degrees of risk is generally best for investors looking to maximize the long-term growth of their portfolios. But as the line moves further to the right, you'll notice that increased risk yields diminishing increases in returns. In fact, at some point, even large increases in risk result in almost negligible bumps in returns. There are limits to how much risk an investor should take on in order to maximize reward. At some point, taking on excess risk no longer makes sense. But adding a modest amount of risk is perfectly reasonable - and occasionally essential - to growing your wealth over time. Taking large risks on speculative bets can be alright here and there, but the core of your investing should balance risk and reward. And, of course, this is also true outside of the bond market. Take stocks as an obvious example. Small cap stocks are typically more volatile than your blue chip, large cap stocks. Yet it's exactly this volatility that gives small caps their appeal for generating above-average gains. Year to date, small cap growth funds have returned about 18.7% to investors while their large cap growth peers have risen just 13.7%, according to Morningstar. That said, the stock return spectrum has an extreme end as well. Much like the C rated corporate bonds that flirt with default, penny stocks are notorious for promising sky-high gains... but most end up losing all value. The best way to maximize returns is to manage risk and diversify your investments. Keep your risk modest and you won't lose your shirt on a gamble gone wrong. And even if you do choose to speculate now and then, be sure to limit your portfolio's exposure so that one bad apple doesn't spoil the whole bunch.